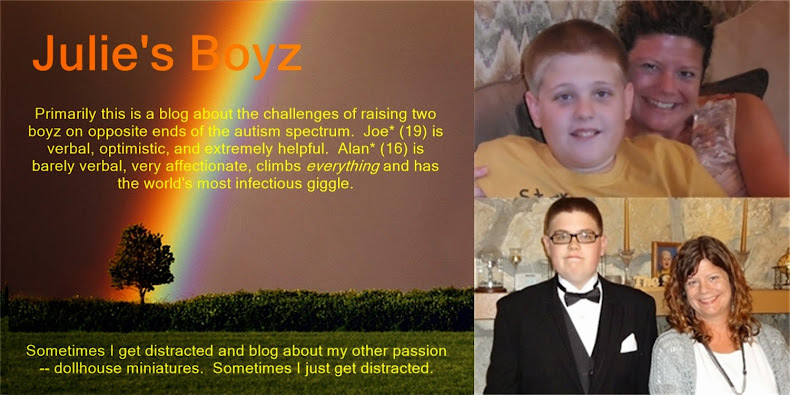 Julie's Boyz: The "Little People" aren't so little! Today the bus driver was about 25 minutes late. Now for a typical kid, this would not be a huge deal. They would hang out, maybe read or watch a video or play a game or just chat with Mom (OK, I can dream, right?) But for Alan, we have to be waiting outside for the bus. That is what we have always done so that is what we must always do. In fairness to Alan, I started this because the kid refuses to wear his shoes in the house. If we only had to get a jacket on and race out the door, we could stay in until the last minute. But since we have to put on socks, shoes, jacket and bus harness and usually use the restroom before heading outside, this is a little much to do once the bus has been spotted. And routines are very important to kids on the autism spectrum! So this morning it was about 35 degrees F outside and Alan likes to sit on the garage floor. I have tried to provide him with a chair, but he always sits on the floor. This child is a bit hypo-sensitive to begin with so it wasn't like he was complaining about the cold but he was getting impatient. Every 30 seconds or so I would get "Bus? Huh?" If it weren't so annoying, it would have been fairly funny. So I finally called the transportation department and they check on the bus and it is less than 5 minutes away by the time I check. Of course, when the bus driver comes she says she made a mistake and drove past our street (hey, it happens) but she called the transportation department to tell them she is coming back for Alan. Now why did the transportation department act like they had no idea whatsoever why the bus might be late when they talked to me? Is it really that hard to communicate? I guess it is. Normally I try to be very supportive of all the "Little People" in my sons' lives. After all, when one of them does not do his or her job, it is usually fairly obvious. I always try to give nice Christmas presents and end of the year gifts to all the many people that help out my boys on a regular basis. I have had people ask me why I tip the babysitter so much. Frankly, I want these people to like helping the boys because when they like their job, it makes my life so much easier.